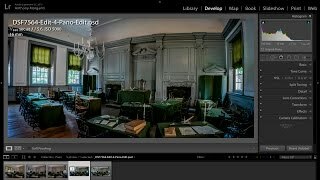 Recently I posted to Facebook, a Panorama of Independence Hall in Philadelphia. I received a ton of comments and questions on the picture and a suggestion that I do a video demonstrating my workflow — hence, this video. Use the discount code: AMDISC15 to save 15% off all of the products from Topaz including Denoise. and use the discount code AM16 to save 20% off everything you purchase from On1. Superb tutorial….thank you very much indeed. Hi, Yep, very good video. Thank You. Hi Antony. I love your tutorials. You are to be commended for a jolly well done job. I do a lot of panoramas, and I always stuggled with the old bendy horizon/edge problem, which you have going on at the top of that image. Folks with an Adobe CC subscription can resolve this by using the adaptive wide angle filter in photoshop. If I may suggest a future tutorial, why not do one on vertoramas? I usually do these by shooting a number of images vertically, importing into LR then rotate them all left or right before putting them through photomerge. If I then run them into photoshop for the adaptive wide angle filter, the results are very satisfying. Keep up the good work old man. I Love your instructional videos. You make things so simple. Thanks! Thanks – great tutorial. I’ve never worried about aligning the exposure of all the photos and Lightroom seems to do a good job of getting it right when it makes the pano. I like your way of doing a little work with the raw files first though – your reasons really make sense. Are you using Color Efex Pro 4 anymore? Great video. I have one question regarding "matching exposure." Sometimes part of a scene is naturally darker than the other parts, for example, because of localized shading by clouds. That darker part may appear in one of the frames used for the panorama. To record the scene more faithfully, wouldn’t it be better to shoot all the frames of a panorama with identical MANUAL settings (aperture, shutter speed, ISO, etc.) and NOT adjust exposure during post processing? Wouldn’t that also reduce artificial contrast edges at the stitching seam? Or am I missing something? Superb tutorial again,am new to lightroom,as using pse15,can one save to the web in lightroom or download to desktop? When i make a panorama, i take one shot first, go to manual, copy the settings from that shot, auto focus in the furthers spot, then remove AF and just take the shots. Is there a way to print a panorama photo in say 3 8×11 sheets? Thanks a mil for that Anthony, as usual I always pick up something no matter how small. Keep making those tutorials. If I may take the liberty to request a tutorial about the "Brenizer Effect/Method". That’s something really interesting for me. Thank you so much Mr Morganti. I really needed this tutorial.